1. They Look Good on Everyone – Not all your bridesmaid do not have the same skin tone nor do they have the same hair color. Some may be blonde and others brunette. That’s where arriving at a single color shade often gets tricky. With rose gold bridesmaid dresses you can put all such worries aside as they look good pretty much on everyone. Think about the last time you saw bridesmaids dressed up in rose gold and you’d recall that all of them looked elegant. 2. They Complement Your Gown – Would you want more attention on yourself or your bridesmaid? If your bridesmaids wear bright colors they won’t complement the lighter shade of your wedding gown. Yes bright color bridesmaid dresses are popular but when it comes to your wedding album they just don’t seem to complement things especially when you are have the wedding lined up outdoors. With rose gold bridesmaid dresses you can relax as this would complement your wedding gown. 3. Mismatch Them Without Any Worry – Mismatched bridesmaid dresses are popular and there is a good reason behind it. Every bridesmaid has a different body type. A style that lets one of your bridesmaids show her curves can look woeful on another bridesmaid. But you still want some kind of uniformity in what they wear to distinguish your bridesmaid from other guests. Here rose gold would be a great choice as this color shade complements every dress style you can think about. 4. After Use – Bridesmaid dresses aren’t meant for a single use. You’d spend lavishly on them and your bridesmaid would like to wear it for other occasions as well. This is where compared to the traditional dress shades your bridesmaid would be able to wear it on other occasions as well. 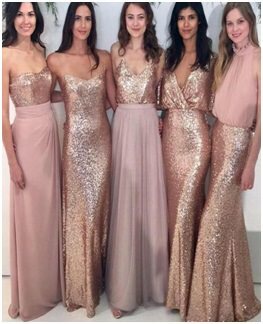 Rose gold bridesmaid dresses aren’t typecast like the grey, turquoise or maroon dresses you see all around. We are sure you are convinced about the choice of rose gold bridesmaid dresses. It is a special shade that has gained popularity in the recent times. After all, your bridesmaids also need to look elegant on your wedding day. Surely not as much as you but definitely they must stand apart from your guests.